In Reverence of Belize Musicians Past & Present! The classic, long overdue history of Belizean musicians past and present finally came through Tony Wright’s touching rendition in narratives of Belize’s most celebrated musical artists and musicians of all times in the book, Belize Musicians Past and Present. It was only recently that yours truly luckily got a copy, earlier than was expected, through the kind efforts of my cousin, Elena Babb, who purchased it and sent it through my sister who had just returned back to Los Angeles from Belize for the September celebrations. I started browsing through it almost immediately, and the colorful photos of some of my favorite Belizean artists, bands, and musicians made me smile and brought me back to the days of my teenage musical explorations in Belize when I would receive a top vinyl album through the Belize post office of one of my favorite musical artists or bands from the States. Tony’s acclaimed book of Belize’s musical best touched my heart as the copy touched my hands. Fresh off the press in Belize, the work pulled me deeply in a moment of solitude as I kept reading every story page by page. In reflecting on its content, I can say that Wright has produced a masterpiece of Belizean musical anthology that will be the best Belize will ever see from a homegrown Belizean social revolutionary in a long time. And the stories were remarkable and moving in scope when you realize how incredibly talented Belizean musicians and artists were then, and are now, and how like everything else like sports and all, were some of the best that the world had seen at that time in Belize. 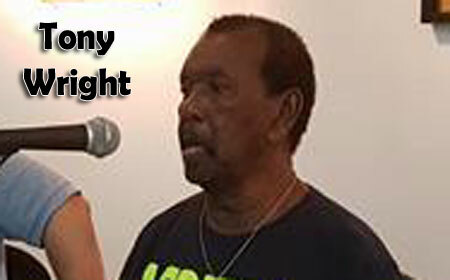 But the newest of the musical stories in Tony Wright’s Belize Musicians Past and Present is the passionate story of Belize’s rising international artist and performer, Lloyd Carlton McFarlane, Jr., aka “Eljai”. In visiting Belize recently, it became apparent to me that “Eljai Rising” was real on the Belize music scene, as a young lady once urged me to send her a copy of his most recent music because she likes the artist. This is growth in musical appreciation among Belize’s young generation of music lovers. So through this review of sorts I can chronicle the special themes of the book and present some of the golden pages that brought joy, happiness and tears to me, like the one on Pete Mathews, the celebrated Belizean horn player who came almost close to a Belizean John Coltrane, and mastered more than anyone else in his league, the great African American art form called “Jazz”. Pete was a relative of mine whose mother made a deep impact on my life as a lady of courage and compassion, and raised a son as Pete to challenge the greatest of odds. And through his music, Pete triumphed today in immortality. Though he left Belize a great treasure in terms of his contribution to the arts in Belize, he is missed day after day as Belize awaits musicians like him for a long time now. Just glancing at the page, “Belizean stars, gone but not forgotten”, resurrected in me some kind of loss as though we Belizeans who believed that they truly mattered, had lost a dear one. From the image of Andy Palacio to the sight of Bob Reneau — the images in the photo essay made me reflect on times when these two brilliant Belizean artists came close to me in person. My relationship with Andy was the deepest and most cherished, but meeting the incredible Belizean dance genius, Bob Reneau in Evanston, Illinois in the United Sates in 2008, where he lived his last days of his life, was a moment of excitement when he brought out his whole collection of photo albums that depicted the history of this outstanding Belizean artist who revealed through his archives that day that he was one of Belize’s most melodic acoustic guitar players and tenor singers. Reneau reminded me of the African American musical artist, Paul Robenson, when he played a cassette tape for me of a performance he did live at a Boston radio station in the 1960’s while he played a harmonic acoustic guitar. In hearing such moving original music for the first time ever, it made me realize what blessing had been bestowed upon Belize through a multi-talented artist like Bob Reneau who was a dance choreographer, a painter, a fashion designer, and a powerful musical artist. These other faces of loss in Belize’s musical greatness brought sadness for their departure: Louis Peyreffitte, Glenn Bood, Paul Nador, Wilfred Peters, Percival “Prof” Drummonds, Cleveland Berry, Gene Gill, Leroy “Bass” Castillo, and even Dr. Lennox Pike, whom it never dawned on me was a musician of some sort. We cherish their worth. Through this journey, under what we call “Belizean Legends”, we see the chronicling of works of Belizean greats of all kind, those like Bredda David, Wilfred Peters, Bamiki Bandula, Lord Rhaburn, and even the legendary Tony Wright himself at one time or the other on this page. We present to our Belizean audiences this noteworthy Belizean book, Belize Musicians Past and Present. Many of these stories can be amplified and revisited through the Belizean Legends documentary series on Youtube and Facebook, and now KREM TV in Belize, where it’s best to revel in the great works that they have left as a legacy for Belizeans both past, present, and the future. Many of their stories are too large for a review of this kind, and it is hoped that sharing the one on Pete Mathews and Bob Reneau through the personal lens of yours truly will prompt Belizeans at home and abroad to find and read a copy of Tony Wright’s book, Belize Musicians Past and Present. And so Belizeans may indulge in the wonder of God’s gift to Belize — that is, its brilliant musical artists and musicians, like Belize’s concert pianist and musical artist, Francis Reneau, who, though not featured in Wright’s remarkable work on Belizean musical artistry, can be seen right on here on Belizean Legends.